Synopsis: Anne of the Island is the third book in the Anne of Green Gables series and follows the life of Anne Shirley from the ages of 18 to 22. In this book Anne finally fulfils her original dream of continuing her education and leaves Prince Edward Island to move to the bustling city of Kingsport in Nova Scotia (a fictitious city based on Halifax) so that she can attend Redmond College there and earn a B.A. in English Literature. Anne's Avonlea school friends Gilbert Blythe and Charlie Sloan have also enrolled at Redmond, as well as Anne's old friend from Queen's Academy, Priscilla Grant. However Anne still feels very lonely and homesick at first until she meets a beautiful and flirtatious girl called Philippa ("Phil") Gordon who also happens to be from the town where Anne was born. The girls quickly become close friends and eventually move into a lovely cottage called Patty's Place along with Priscilla, their mutual friend Stella Maynard, and Stella's aunt Jamesina (who acts as their chaperone). Anne returns home to Green Gables during all her holidays and continues to stay in touch with her old friends. Then, halfway through her years at college, Anne receives an unexpected marriage proposal from Gilbert Blythe (who has loved Anne since they were both children). Deeply shocked, Anne rejects Gilbert since she doesn't recognise her true feelings for him. Gilbert is heartbroken and the two of them drift apart. It's then that Anne meets a dark, handsome, rich boy called Royal ("Roy") Gardner who is exactly the type of man that she has always fantasised about marrying. The two of them then date for two years until Roy's eventual marriage proposal makes Anne realise that she has never been in love with him and has only ever loved the idea of Roy. This prompts much soul-searching and Anne eventually comes to realise where her affections truly lie. There were so many aspects of this book that I found extremely aggravating. Although Davy doesn't have as much of a presence in this book as he does in Anne of Avonlea he still gets quite a lot of page-time and is still an unpleasant annoying brat. And considering that this is the only book in the AoGG series that covers Anne's university years there really doesn't seem to be all that much academia going on! I was hoping that this book would provide a fascinating insight into what it was like for a woman to attend a North American university in the Victorian era but in fact most of the details of Anne's university life were completely glossed over. 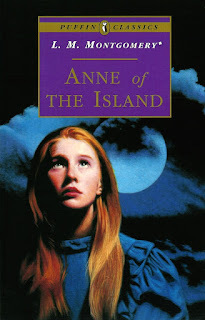 This book mainly seemed to consist of... Anne hanging out with her friends in Patty's Place and then going back to Green Gables on her holidays. Anne's friends in this book are dull and uninteresting - I didn't even remember Stella and Priscilla from Anne of Green Gables - apart from Philippa Gordon and I stopped liking her after the "cat incident". Montgomery handles Anne's boyfriend Roy Gardner in exactly the same way that she handled Dora Keith - the character's own sister even calls him boring - and is only there as a plot device to conveniently keep Anne and Gilbert apart until the very end. This was so frustrating because Anne of the Island could have been a far more interesting novel if Montgomery had actually took the time to develop Roy's personality and his relationship with Anne more and had made him more of a legitimate rival to Gilbert! And finally I was completely disgusted by the animal cruelty that goes on in this book. Anne and her friends try to kill a stray cat just because it keeps following them around and Mr Harrison strings his dog up just because he doesn't want it any more! I was initially planning to read all of the Anne of Green Gables books this year but because of my reactions to the first two sequels I've got absolutely no desire to do that now. Instead what I'm going to do is to just skip books 4-7 in the series by going straight to Rilla of Ingleside (the reviews for that book have made me think that I might actually like that one) and to watch the first of the Megan Follows films. Interesting! I'm sorry you aren't enjoying them, but since you're not, by all means quit reading them -- not every book is for every reader. I know! I'm gutted because I really did think I was going to love this series. I'm still going to read 'Rilla of Ingleside' though (because I would like to learn more about the Canadian home front) and 'Emily of New Moon' is still on my Classics Club list. The Emily books have a rather different feel to them, so you might like them better, just like I don't like them as well. I've noticed that. There are people who like both the Anne and Emily books but no-one seems to enjoy them to the same extent.